M-26-Julio 羊とめぐる冒険 BMW R1200GSで世界一周の旅 Hello Africa :-) モロッコ・ペンギンには遇えるのか?? I woke up at 8:30am. I set the alarm at 7:30am but I did not even realised it went off. I guess I was really tired. My ferry was leaving at 10:30am, so I still had time to get ready, no rush. I left the hotel after 9:30am and got to the jetty before 10am. It's been since Urguay - Argentina La Plata river crossing to go on a ferry. 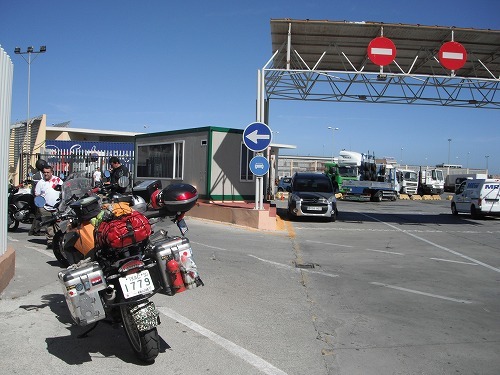 There were 3 BMW R1200GS Adventure with Spanish registration. After we got on the ferry, they treated me a cuppa! Nice. We sat on the seats and relaxed. The ferry left the harbour at 10:30am! Heading to Africa!! I was very excited. Saying a good-bye to Europe. I will be back soon. We arrived Africa!! My first step on African Continent!! 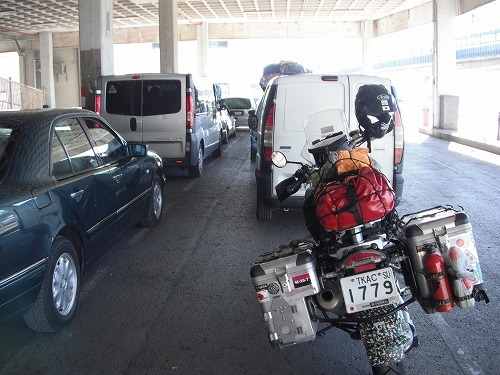 I said a good-bye to Spanish riders and rode into the city of Ceuta. 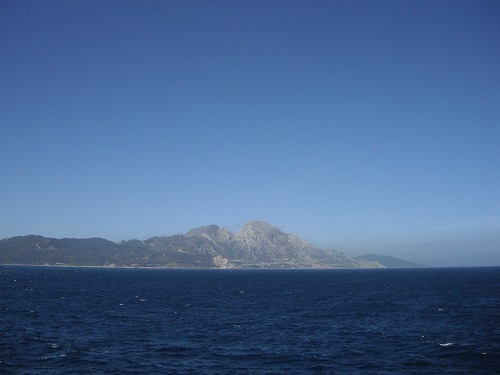 A view of Ceuta on the way to a border to Morocco. Just before the border, there was a money exchange guy and I asked the rate. It was 1 Euro = 10.80MDH. Not bad. So I exchanged 70 Euros. I asked him if I could join an insurance for motorcycle. But he said there was no agency at the boder and I needed to go back to the city! So I went back to the city. I went to Tourist Information Office and asked where I could get "Carta Verde = Green Card". The staffs were really nice and told me how to get there very clearly. I found the agency very easily, but I was told that they can only insure Spanish registered vehicles!! 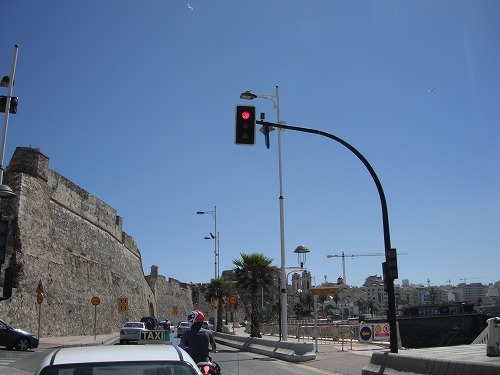 I asked if there was any other, but the staff was not sure if anyone can cover a foreign vehicle here in Ceuta.But anyway, he told me another insurance agency where I might be able to get one. If I could not join a motor insurance, I might have to go back to the mainland Spain... 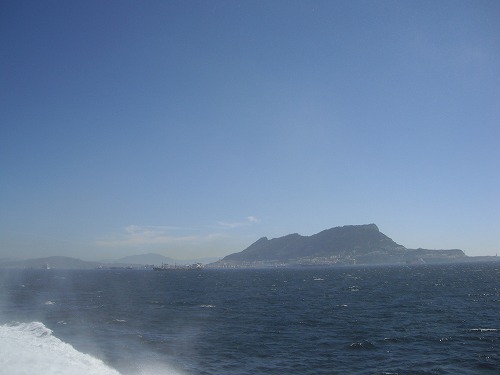 I did not want to end up saying "Hello, Good-bye Africa". But, there I was told to go to the border... So I went back to the border. Exiting out Spain was really easy. In fact, I needed to tell an immigration officer to give me an exit stamp on my passport. Otherwise, I could ride through without stopping. 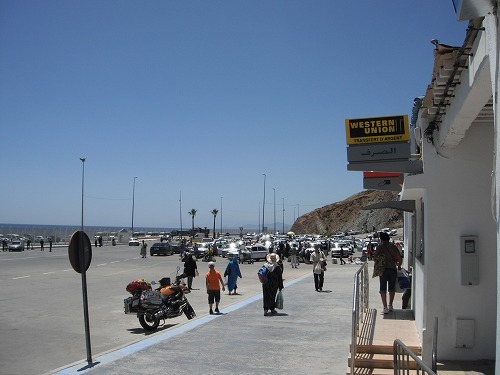 Once I entered Morocco side of the border, soon so called "Guide" came up to me and started to bother me. 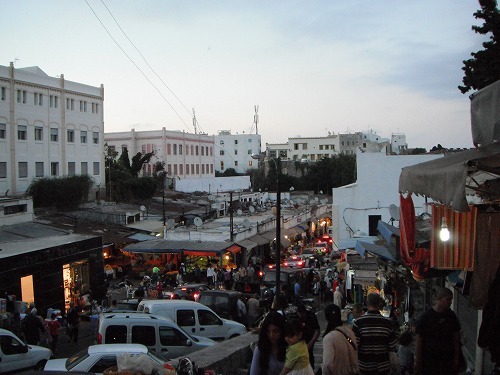 Immigration and temporary importing processes were fairy easy in Morocco side too. But the "Guide" asked for a tip... Well he told me what to write on the tourist card and the vehicle import document, so I gave him a 5 MDH coin (60US cents). He was not really happy though. I rode along side of the coast. The view was beautiful, but the road condition was not really good. 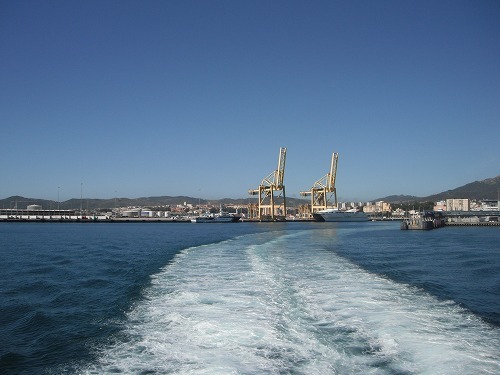 After Tanger Med (the new port), the road lead to the inland and it became a motorway. The toll was 11MDHs (US$1.50). 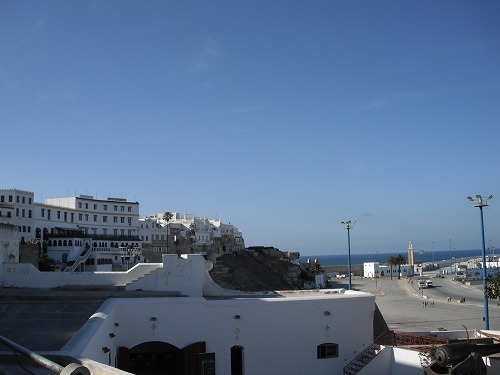 I got to Tangier around 2pm Moroccan time (1 hour behind Spanish time). But I could not find the hostel I booked easily. 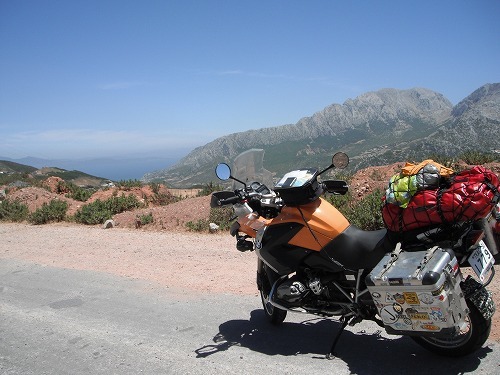 My GPS for Morocco was not routable, so I tried to get there with the way point only. 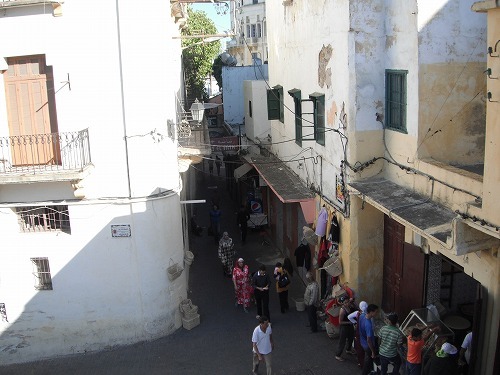 I was so close to the point, but in the old town "Medina", the streets were like Labyrinth. So I hired a taxi to lead me the way. But even taxi was not sure where it was... Then around Kaspa, a man called Abdul came up and said "let me handle it!!" In the end, I could get to the hostel, but a lady at the hostel did not really like Abdul to be around. The hostel did not have a parking space, but they have arrangements with "Hotel Ontinental" nearby and with 4 Euros a day, I could park Esperanza there. The security of the hotel sent Abdul away from the property of the hotel. But the guide was waiting ouside and asked for his guide fee. He said 250MDHs, but I offered 50MDHs for my gratitude. He insisted, but so I did. 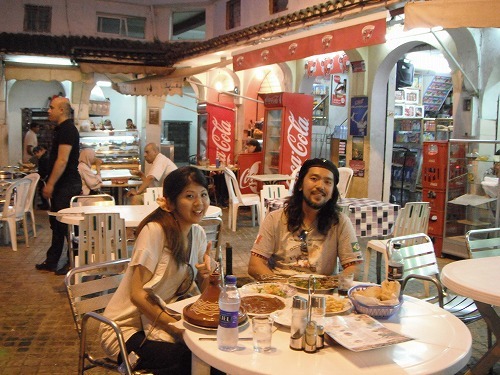 I told him that if I found a traveller in Japan looking for a place, I would help the traveller without any money. "Didn't you do it from your kindness?" I said. Anyway, he lowered the price to 100MDHs, but I said if he did not want to take 50, that's fine with me. Then he said "I have a family to support and if you do not pay 100MDHs, I have to steal your bike!" He was threatening me now. I was not sure what kind of connection he had in Medina (he seemed to be well-known in the area. Many people greeted him). Esperanza was in a carpark of a decent hotel and the security gard - Saiid - was a good man, but I would not know who would be taking the nightshift. I was very reluctant to pay but with this much if Esperanza would be damaged or stolen, it would not be a good idea. So I gave him 100MDHs... I was so upset as this would not benefit any other future traveller. ANyway, I checked in to the hostel "Dar Bargach". As it was a really hot day, I took a shower fast. I was net surfing till it got cooler, then I went out to Medina. The view was not bad at all. The white building is "Hotel Continental" where I parked Esperanza. Oh Tomo whom I met at Funky Granada would be staying here tonight. This "chaoic" atmosphere made me feel I was in Morocco! This is Gran Mosque. But it was not really "Gran". In Medina, while I was walking, many guys came to talk to me and wanted to "guide" me. 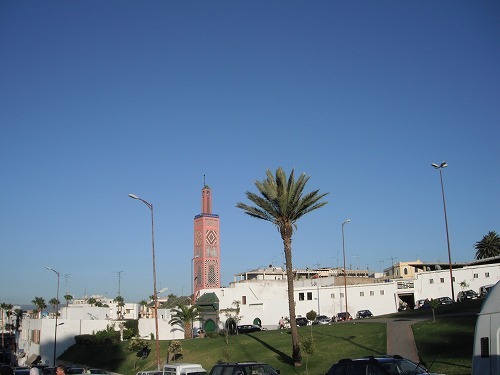 That's why many tourists saying "Moroccans are bothering". They are not telling us the ways from their kindness, rather they just want to make money. Once I got rid of one, another came to me soon. So I got tired wwalking. I could not even ask for a diretion as once I asked, they would follow me all the way. Around 7pm, I wne to Hotel COntinental if Tomo was there. I greeted Saiid and went into the hotel. But she was not there yet. Hummm, she should have arrived Tangier with the 5pm ferry. I waited for 15mins or so and she showed up. She was lost in Medina too!! WHile she was checking in, there was a group of Argentinians and they saw me in the beret in Che style. They really liked me in the style and asked me how I was traveling. Once they knew I rode trhough Ruta 40 to Ushuaia, they were very pleased!! Then with Tomo, I went to Medina again. 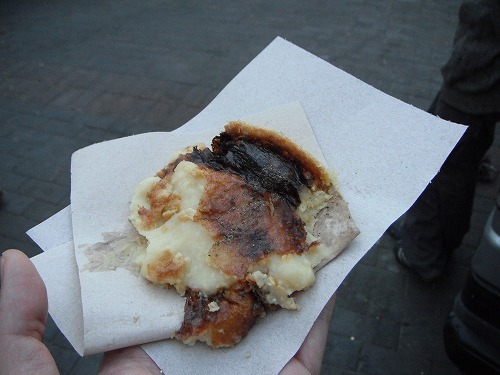 A slice of bean cake (?) cost 1MDH. It was cheap and tasty! 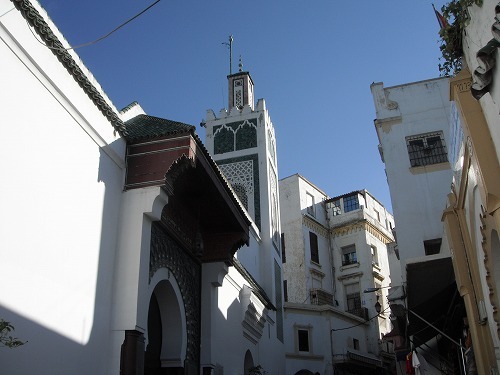 A view of Mosque from a plaza. The local marcket. 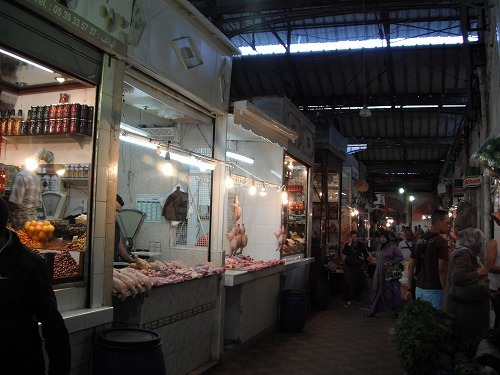 The atmosphere and those goods sold were so similar to those markets in Bolivia. The scenery of the streets was also like one in Bolivia too. 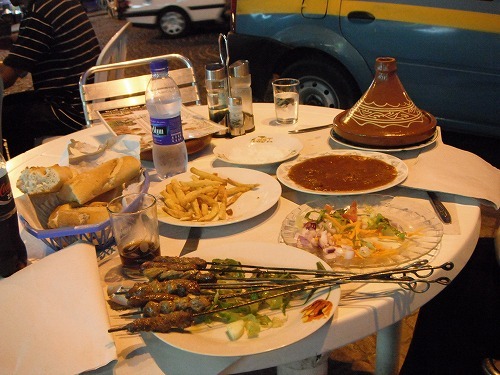 We had a typical Moroccan meal for dinner. Moroccan cuisin is spicy and I like it! We wnet back to each accomodation around 10pm. After 10:30pm,　I heard "Adhaan" calling for the prayers.We will explore Medina even further tomorrow. I kinda like Morocco.